This issue's guest article comes from Ricardo Contreras, our Director for Training & Partnership Development. It is the first in a series which will periodically highlight important features and tools in ATLAS.ti. We will focus on features that are sometimes overlooked or under-utilized, and will break them down to their basic steps and emphasize important aspects. Through our training programs and webinars — many of them are available free of charge— we are always in touch with our users. Besides sharing their expertise, our trainers listen closely and address your common questions and concerns. 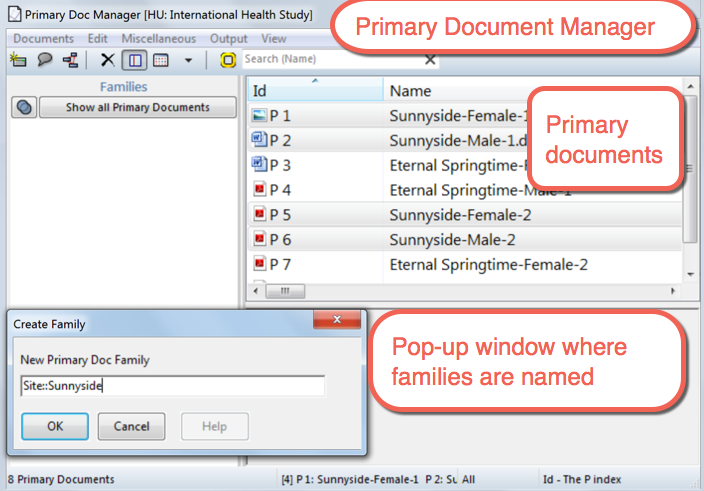 This newsletter’s feature article will look at Primary Document Families. Users often tend to postpone this type of document organization until the later stages of the analysis process — and sometimes even ignore this step altogether. We get it, diving right into coding is very satisfying. However, it unnecessarily limits the potential for a good analysis and prevents you from using the software’s full capabilities. Have a look and I hope you can use these tips in your current project. Primary Document Families: What are they? Having a good PD family system facilitates the formulation of questions such as these because it allows data exploration across groups of participants and documents. 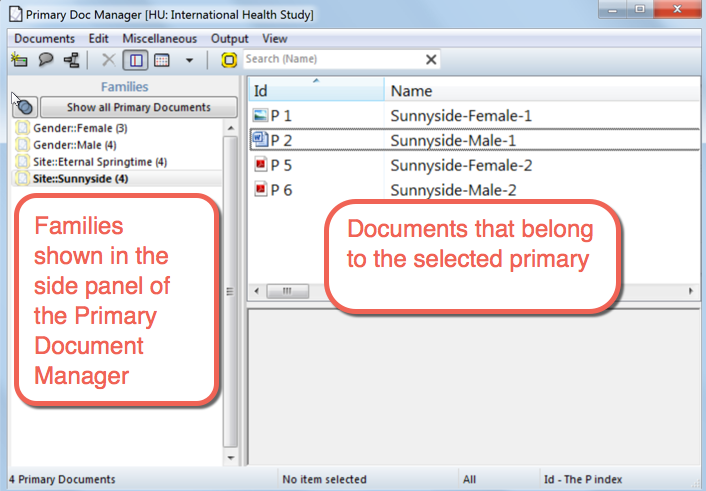 A good primary document family system will allow you to set the stage for effective data exploration and analysis. Start early on, ideally as you set up your project. Although your documents can be organized in multiple ways according to their characterizing attributes, not all of those attributes might be relevant from an analytical point of view. That is why I recommend that you begin by determining what is and what is not relevant for you. A table like the one below can help. 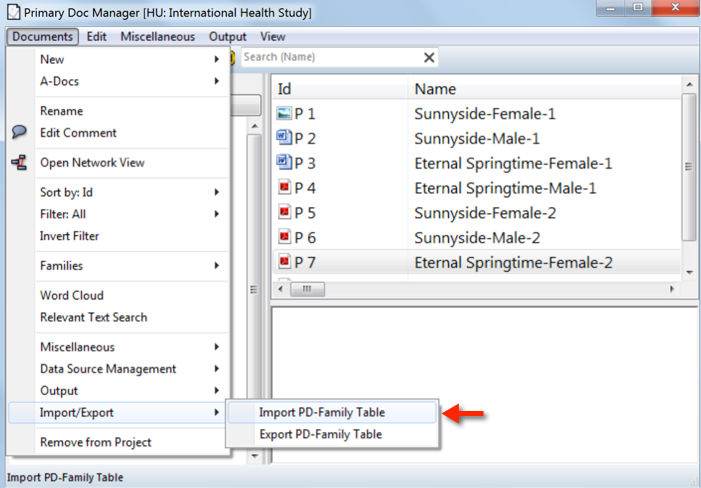 Please note: This is not the only way to import PD families from spreadsheets. Instead of starting by exporting the original primary document structure, as I suggest in this article, you may decide to start by creating the spreadsheet from scratch and then importing it. 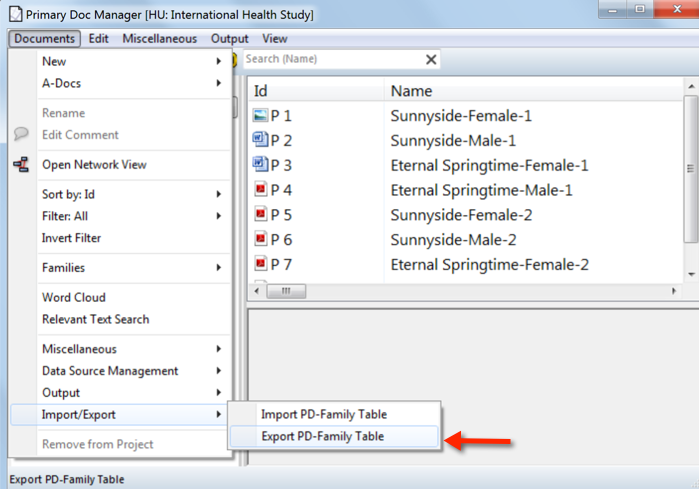 However, I think that starting by exporting the spreadsheet with the PD family structure is easier and safer since you avoid making mistakes in the way columns and documents are named. (Pages 245-248 of the ATLAS.ti manual describe the PD family table importation process. 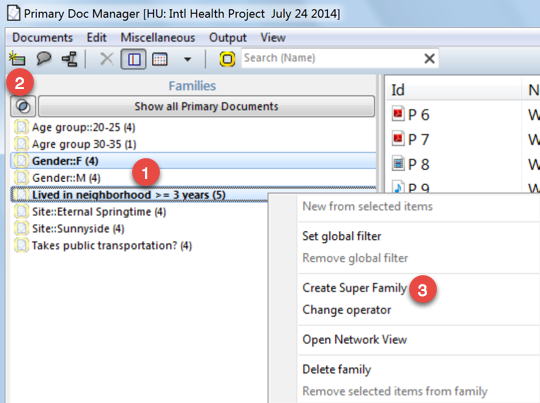 Super PD families allow you to further group your documents by combining families using Boolean operators. For example, if you want to explore what women from the Sunnyside neighborhood had to say about accessing public transportation, you would combine the “Site::Sunnyside” family with the “Gender::Female” family using the AND Boolean operator. (The AND Boolean operator retrieves the data that lies at the intersection of two subsets, in this case “Sunnyside neighborhood” and “Women”). 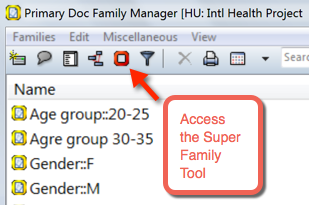 Then you select two or more families that you want to combine holding down the Ctrl-key, right-click and select “Create Super Family.” The resulting Super PD family will be available on the PD Manager and can be used to explore data across documents. 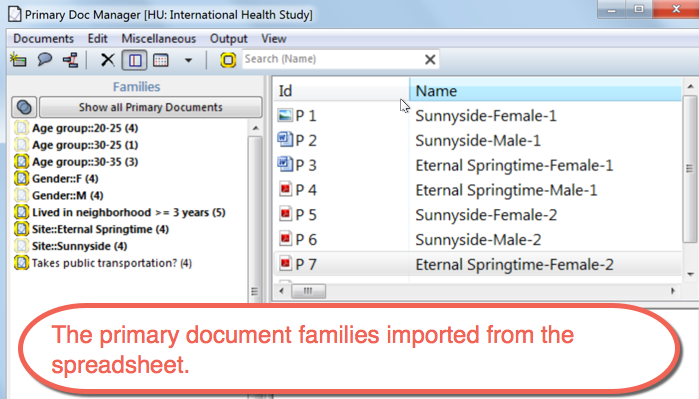 Alternatively, you may create super document families using the Super Family Tool, which can be accessed through the PD Family. Through this tool, PD families can be combined using the OR, AND, XOR (Exclusively OR), and the NOT Boolean operators. 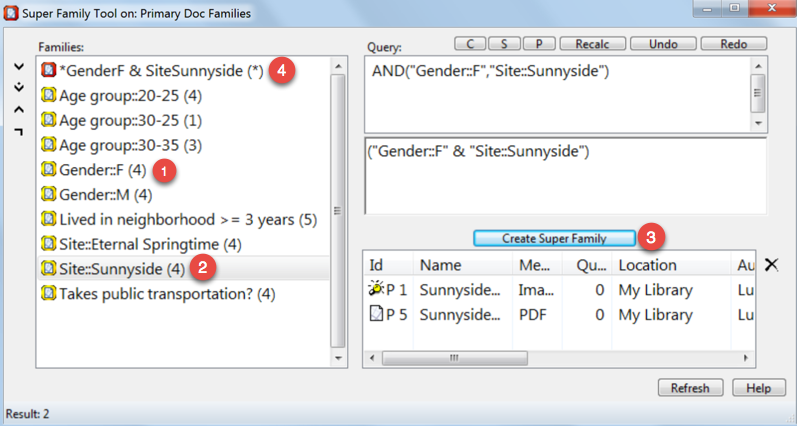 The figures below depict the process of creating super document families in the Super Family Tool. For a detailed description of families in ATLAS.ti, read this manual section. My best wishes for your analysis. If your organization is in the process of evaluating ATLAS.ti for a multi-user or campus license, or if you would like to introduce it to your students in class, schedule a FREE one-hour software demo through web-conferencing. Interested? Contact us at [email protected]. Check out the new schedule for our FREE 60-minute webinars that introduce ATLAS.ti for Win and ATLAS.ti for Mac OS X (available in English and Spanish). In these webinars, the instructors introduce the software and its fundamental features, and answer participants’ questions. They are scheduled conveniently for timezones in Asia/Pacific, Americas, Europe, and Africa. Want to register for these webinars? Sign up at http://atlasti.com/training/free-training/. On our blog, you’ll find articles from researchers across the world and all disciplines. They share how they work with ATLAS.ti: research applications, interesting approaches to analysis, lessons learned. Check it out: www.blog.atlasti.com. — If you have something to share with the international community of ATLAS.ti users, please contact us at [email protected] and we will publish your post.